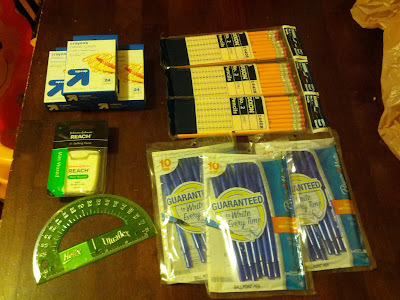 Fru-Gal.org: This week's school supplies round-up! This week's school supplies round-up! I stopped by Target and Office Max this week to get some more great deals on school supplies! The Up & Up crayons were buy 2 get 1 free after coupon at Target. They cost 25 cents each, so I paid 50 cents for all 3 packs (16 cents each). The Reach floss was free after coupon and will be a good addition to an Operation Christmas Child box. At Office Max, I picked up the packs of pens and pencils for 10 cents each (although my store didn't have them marked as such, but the cashier was nice enough to mark them down, so double check your ad). I also got the protractor for 5 cents. Altogether, I spent $1.15 on the above pictured items. So far, over the past few weeks, I've spent $5.78 out of my $10 budget to see how many school supplies I can round-up for Operation Christmas Child. This includes 100 pens (10 packs), 30 pencils, 72 crayons, 8 highlighters, 3 pencil sharpeners, 5 spiral notebooks, 2 packs of paper, and 1 protractor.